Classics at the Intersections: The Dorian Invasion and 'White' Ownership of Classical Greece? 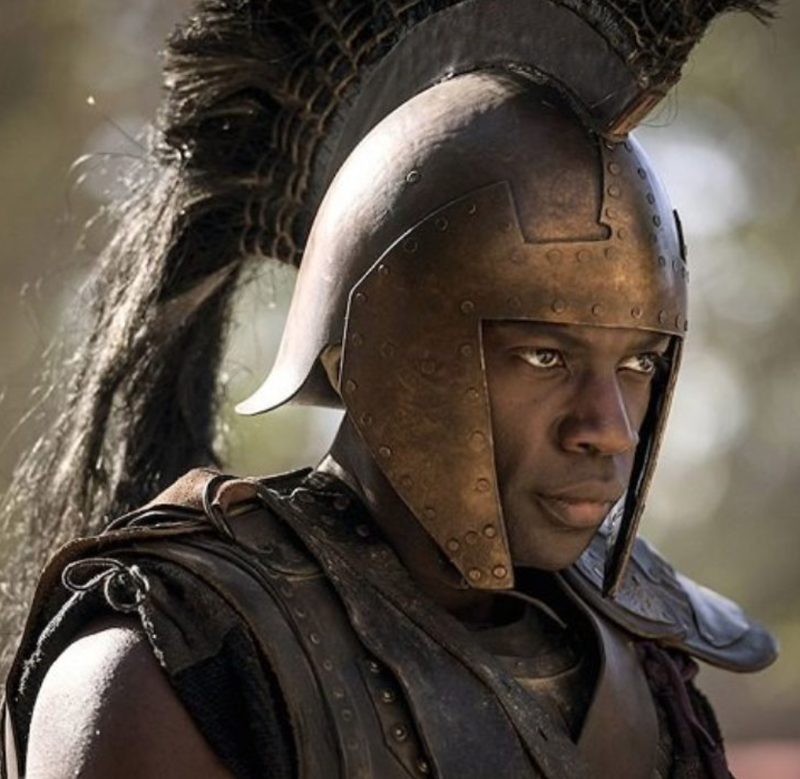 The Dorian Invasion and 'White' Ownership of Classical Greece? I was speaking with a student last semester. She loves Classics, but she can't seem to get her parents to understand why. She's Indian and her family and family friends, she tells me, have asked her things like why she wants to give up her own culture and study someone else's. India, of course, has a long history with the ancient Greeks and Romans. Greeks even settled in parts of what was called India in antiquity (though are parts of various modern nations now). India appears in our Greek sources as early as Herodotus (and earlier is some fragmentary works), was an important players in the ancient trade networks that went through the Persian empire, and became part of Greek reality in the Hellenistic world as a major political and military player. The idea that the study of Classics is 'foreign' to a student from India more than the descendants of Celts and Germans and Norse people is weird. And one needs to wonder why (though we already know the answer: hint, it's racism). Turns out, I was wrong! 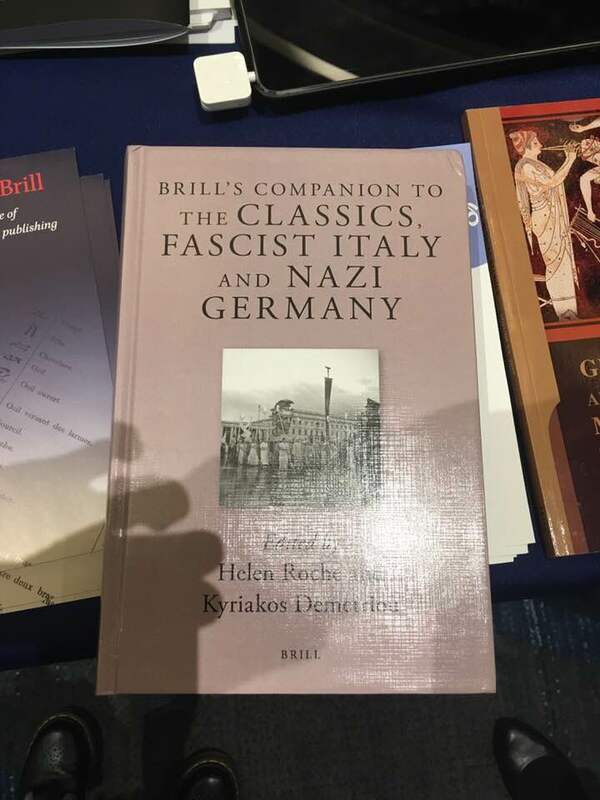 I am pretty much solid German on my mom's side (she was the first generation of her family in the US to marry a non-German dating back to before the Revolutionary War) and, it so happens that, according to the Nazis and their Romantic-Nationalist predecessors and many a neo-Nazi today, THAT MAKES ME DORIAN GREEK! 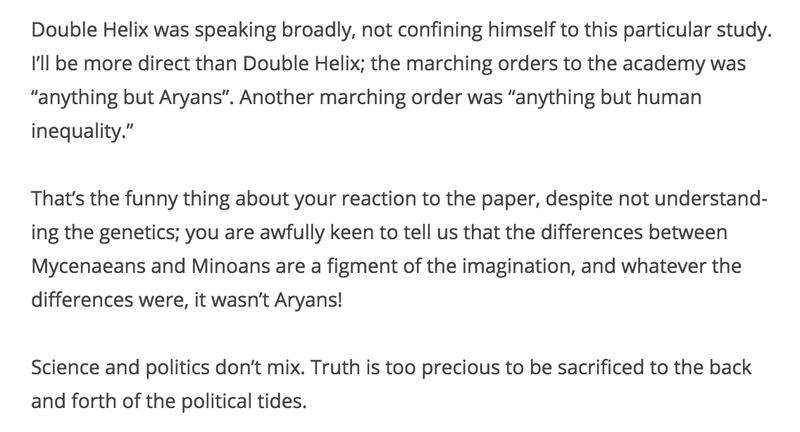 In other words, it's time to talk about the myth of the so-called "Dorian Invasion" and the myth of an Aryan Ancient Greece. H/T http://www.ars-longa.sitew.com/Le_mythe_de_l_Aryen.B.htm#Le_mythe_de_l_Aryen.B for the map. As with many a historical myth about the origins of various Greek cultures, this one has a source in Herodotus and was an attempt by mostly German scholars (at first, it seems) to explain the changes in language from non-Hellenic to Hellenic. The mysterious Pelasgians appear as a 'native' substrate of possibly Anatolian origin (except the Athenians, who were indigenous but 'became Greek' by changing languages..maybe..Herodotus is a bit dodgy on this one), while the Dorians--those vigorously masculine Greeks best represented by the Spartans, as you can see from the map above--from a pre-Nazi text--those Dorians came from Germany! The myth of the Dorian/Aryan/Nordic invasion begins, in many ways, as a failure of methodology, specifically, as a result of historical positivism. Historian Jonathan Hall once described historical positivism as a mode of seeing in "myths of ethnic origins a hazy and refracted recollection of genuine population movements" in the Bronze Age. Variants of these myths were "pathological aberrations from a 'real' historical memory" (Hall, Ethnic Identity in Greek Antiquity, 41). Unfortunately, these "pathological aberrations" became bound to ideological positions that became linked to political parties and movements and race science. As one can read all about in my new favorite book Brill's Companion to the Classics and Fascist Italy and Nazi Germany (the chapters by Wiedemann and Whyte specifically) or (going back pre-Nazi) in Helen Roche's Sparta’s German Children, Hitler and many a German firmly believed that Spartans/Dorians and Germans were one people and that the martial valor and glory of Greece was the result of Germans invading Greece and establishing a civilization. They, the modern Germans, were the both the progenitors of ancient Greek civilization and its heirs. And they, as Tacitus explained to them, were a pure people. Their Blut und Boden ideology explained both who they were and why they were born to be conquerors. I've even read 19th century texts that suggest that some German scientists and anthropologists explained the fall of ancient Greek civilization by the deterioration of Germans too long from their proper climate--the heat of Greece enervated them over time, making the rise of a new Greece in Germany the only solution. Hitler certainly saw it that way as did many of his predecessors, like Karl Otfried Müller. 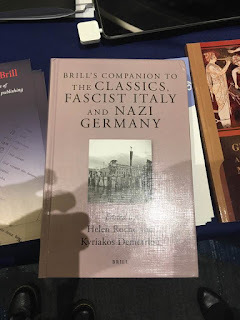 Whatever other flaws there may be in Martin Bernal's Black Athena, pointing out the long trail of classical philologists and historians invested in a northern European invasion as the only possible explanation for the development of an advanced civilization in southern Europe was not wrong. 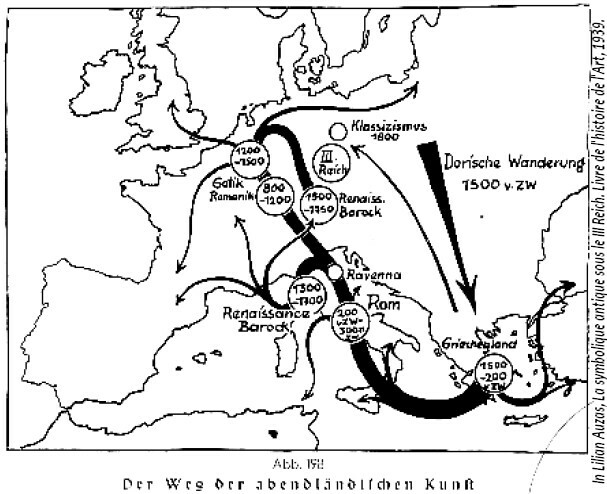 The Aryan/Dorian (later Nordic) invasion was used to explain not only ancient Greek civilizations, but also those throughout Asia and even north Africa. How long did historians and archaeologist struggle to fit the evidence into a narrative of a Dorian invasion? This great article from 1978 laying out the evidence debunking the invasion myth gives you a clue. And yet, even while scholars have moved on, the general population has not. And the recourse this public makes to genetics is complicating the issue. While there is quite a bit of good work being done in the realm of genetics, popularizing articles in magazines like Science and National Geographic make it seem like we have hundreds upon hundreds of solid samples to text from, resulting in "new" discoveries every few months in the origins of genes for "whiteness" or "blackness" or homo sapiens vs. Neanderthals, etc. This is a comment on Dimitri Nakassis' blog post about the Science article. The commentator and his predecessor "Double Helix" view the result of a 4-16% admixture of "northern" DNA possible for the samples labeled Mycenaean as DNA proof, to the commentator and others, of the Dorian/Aryan/Nordic reality of ancient Greece. The longevity of this myth that all southern European, north African, and Eastern/Central Asian civilizations were the result of northern invaders is real, even if it is now playing out in the realm of pseudo-science. Whatever someone wants to believe, they will find evidence or skew evidence to support it because that's how ideology works. 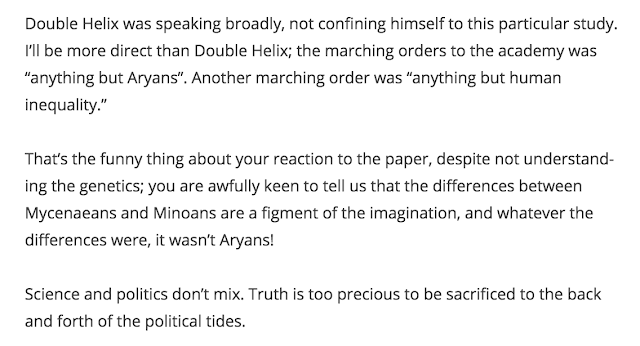 But the Aryan/Dorian/Nordic myth does real harm if Classicists and ancient historians don't challenge it and do it regularly. It excludes people from our discipline whose history it is just as much as it is anyone's (more so in some cases) by allowing one small group of people--'white' people--to lay claim to it. It also puts a value on whiteness that encourages adoption of 'whiteness' as a way of viewing and moving in the world by those peoples who may have been excluded in the past--like Greeks or Latino people, who are increasingly identifying as white while simultaneously developing virulent strains of white supremacy of their own. We see valuation on whiteness lead some individuals (like N. Taleb) to reject and work tirelessly to argue away cultural heritage and connections to a non-northern European past. In the end, the lingering myth of a Aryan invasion in the popular imagination, though now grounded in different 'evidence', perpetuates the whiteness of our field, continues to send a message that Classical Greece 'belongs' to northern Europe, and, perhaps the worst thing of all, seems to have made some corners of the internet nostalgic for the 2004 Troy movie and Brad Pitt as Achilles. What can we do when theories long debunked continue to prosper and cause harm? In addition to trying to make our research accessible to the broader public, I say we enjoy the new Achilles.